"People could not understand Krishna. Although He advised personally in the Bhagavad-gita that sarva-dharman parityajya mam ekam (Bg. 18.66), they are so rascal -- avajananti mam mudhah manusim tanum asritah (Bg. 9.11). They thought that 'Krishna is ordinary person, maybe little learned or little powerful.' But they did not take up Krishna as the Supreme Personality of Godhead. Even big, big authors, scholars, they cannot understand. Therefore Caitanya Mahaprabhu -- He is Krishna Himself -- came again to teach us Krishna consciousness for our benefit. Therefore He is maha-vadanyavatara. So if we want to understand Krishna, we must try to understand Krishna through Caitanya Mahaprabhu. Then it will be very easy to understand. Other people, they do not try to understand Krishna through Caitanya Mahaprabhu. They try to understand Krishna directly; therefore they fail to understand. Manusyanam sahasresu kascid yatati siddhaye (Bg. 7.3). Yatatam api siddhanam. So Krishna cannot be understood by ordinary way. Krishna can be understood only through one way, not many ways. What is that one way? 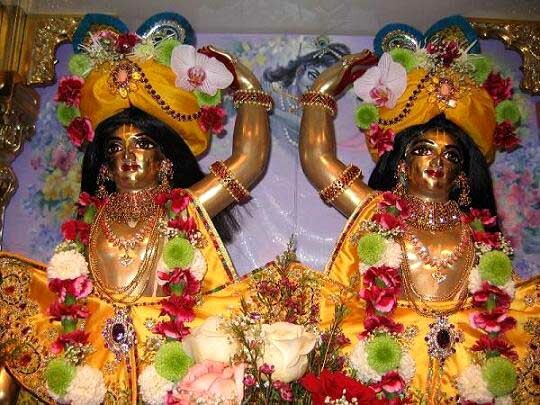 Bhaktya mam abhijanati yavan yas casmi tattvatah (Bg. 18.55). Only bhakti."